Speak to a live person, anytime day or night! We will never sell you something you do not need & we don't make commission! We can help you save BIG on energy this year! We'll never sell you something you don't need! Our sales and service people don't make commission. 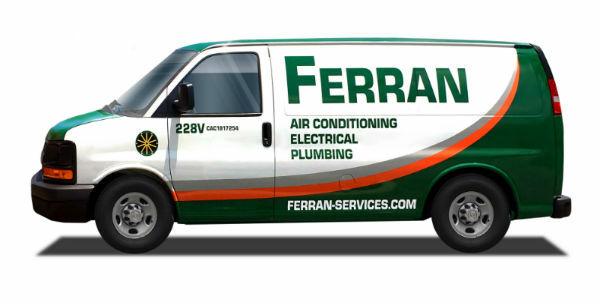 At Ferran Services, we have various spring offers, that include deals on installation, duct & insulation, electrical, and plumbing. Visit our Specials Page for More Details! Trust us with all your heating & cooling, electrical, and plumbing needs! 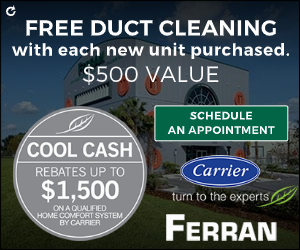 Ferran Services provides quality and personalized HVAC services throughout Orlando, FL, Volusia, FL. When you contact us for assistance, a knowledgeable member of our staff will immediately focus our extensive resources on the resolution of your project. We eliminate the stress and aggravation frequently associated with heating and cooling repair & installation, plumbing service, and electrical service, by avoiding lengthy wait-times, multiple house calls, overpriced products, and unnecessary services. No one at Ferran Services works on commission. We are all committed to your best interest. By never taking advantage of your situation or talking you into something you don’t need, we ensure a rewarding experience from start to finish. Want to know What Powers Ferran? We are ALWAYS looking for new ways to increase your home’s comfort while saving you money on your Power Bill. You will ALWAYS speak to a live representative and we NEVER pay our sales professionals a commission. And, with over 125 vehicles on the road, we are ALWAYS available to provide you service! It’s what’s kept us in Business for over 100 Years! 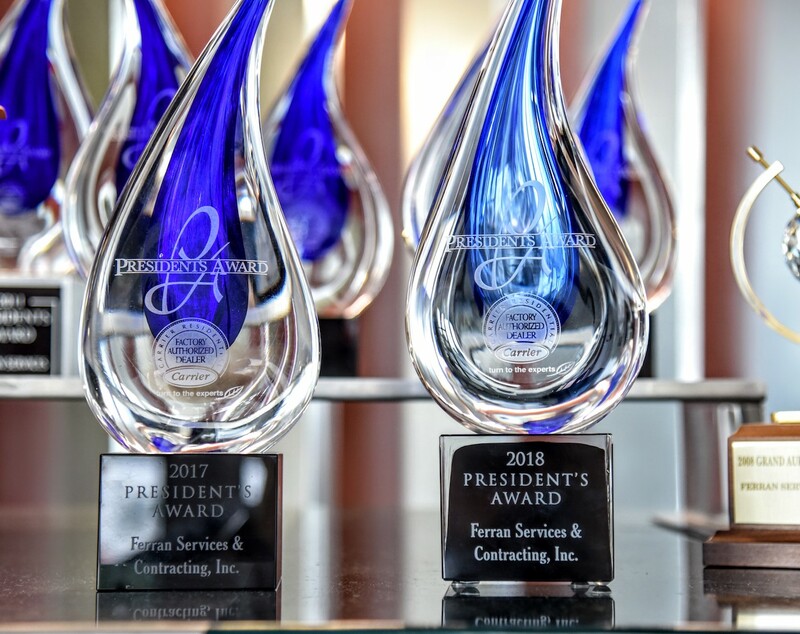 We’re excited to announce that we’ve been awarded the 2019 Carrier Presidents Award for the eighth time! At Ferran Services, we take the work seriously, and we concentrate on the highest level of workmanship and dedication. We know what counts. Your quality of life, home comfort, and investment are protected by our level of excellence. As a Carrier Factory Authorized Dealer, our sales and service technicians keep current with the latest innovations in products, features, and technology. We rely on Factory Authorized replacement parts to restore system sound levels, efficiency, and longevity. 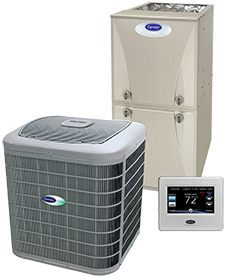 We install Carrier HVAC systems, offering the most extensive, meticulously engineered, and innovative solutions to home comfort on the market today. We protect those systems with cost-effective maintenance agreements and are here whenever you need us for emergency repair. To further promote comfort and savings, we offer window films. Heard the News? Ferran’s Green Residential Maintenance Plans have a new Benefit! In addition to same-day service, discounts for all trades and worry-free scheduling, you will now receive FREE diagnostics on AC and Plumbing Services when you make your repairs! AND, you will receive this $79 credit as often as you need us throughout the year! What does it mean to receive free $79 diagnostic fees with your maintenance plan? It means your $99 basic maintenance is just $20 with just one use of our services in a year! Use us twice and Ferran is paying you to properly maintain your unit! Skeptical anytime a service company tells you something is free? At Ferran you don’t have to be. No one at Ferran is paid commission and we will NEVER sell you something you don’t need. Our goal is to establish a long term relationship with our clients through proper maintenance, integrity and professionalism. Since 1910, Ferran Services has continued to be recognized as a leading and trusted provider of HVAC services across Orlando, FL, Volusia, FL. Our dedication to customer service has been recognized by our A+ rating from the Better Business Bureau. We are very proud to have been distinguished with Carrier’s top honor. 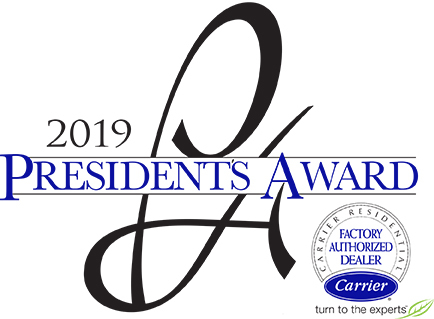 The Carrier President’s Award is reserved for those dealers who exemplify superior standards in business practices, product recognition, technical skill, and customer loyalty. When you count on us for installation, system upgrades, seasonal maintenance, and repairs, Ferran Services answers with quality that stands up year after year.